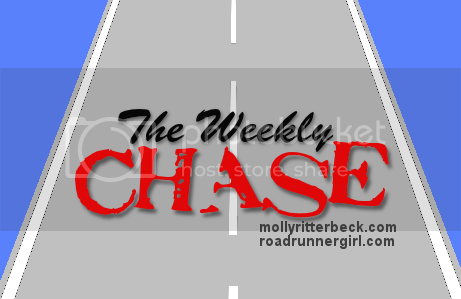 Road Runner Girl: The Weekly Chase #30! Here's to Monday and a new week! I am currently in Destin on a mission trip with my boys. To learn more about what I'm doing you can see my thoughts about it in yesterday's post. It's time for another Weekly Chase! I'm excited to tell you about my goals for this week! I hope you will link up with us and join the monthly challenge! Goal #2: Get in at least one walk each week for some cross training. Yes! Yay! So glad I got this in this week! Goal #4: Work on St. Jude fundraising. Some. I tweeted out my link a few times. Goal #5: Update my resume. No. I didn't do this but I did apply for a job on Monday and got an interview on Wednesday. I'm still waiting to hear back from them on whether or not I got the job. Goal #6: Start preparing for Hayden's birthday. Some. Hayden made me a birthday list, told me the meals he wanted, and what type of cake he wants. Goal #2: Get on at least one walk each week for some cross training. Hopefully I can get this done in Destin with the boys. If not...I will try at the end of the week after we get home. Goal #3: Do my "All About the Minutes" exercises every day (challenge goal). The biggest obstacle with this goal is remembering to do it while I'm out of town. Goal #4: Be an awesome witness for some awesome kids this week! I hope I am able to help change at least one child's life this week while I teach them all about how much Jesus loves them. Goal #5: Help Hayden have an awesome 8th birthday! His birthday is on Saturday! I can't believe my first born baby is already 8 years old! So that's it for this week! Gonna be a different week for me so I'm hoping I can still be successful with all my goals!